How often have you heard of perfectly competent cooks and bakers saying that they’re too scared to attempt making macarons? Have they got cold feet or something? When they do finally attempt making them, I love how so many of them post excited messages on the Facebook page. You know the one that appears the most? “My macarons have feet!” You’ve no idea how much I want to dance too, knowing that some of that feel-good-macaron-feet pleasure has been spread. It may be chilly with sub-zero temperatures outside Paris, but this warms the heart no end. 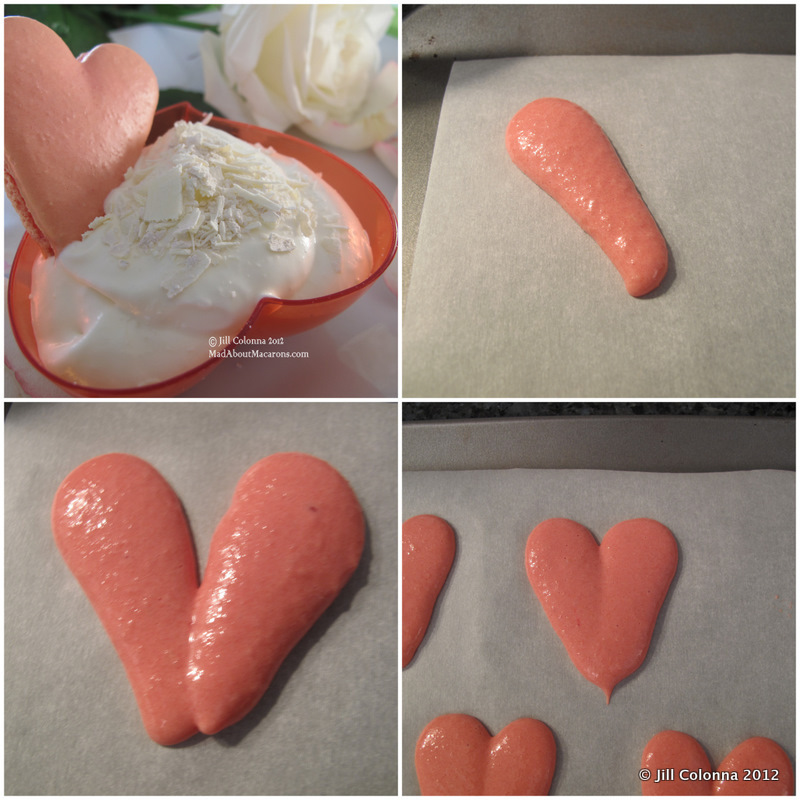 This week some of you asked how to pipe out macaron hearts. It’s easy peasy. Just imagine you’re making a ‘V’ shape in 2 lines. Do it quite quickly: push down a bit more mixture at first at the top of each line and taper off coming down. As the mixture spreads out slightly on the baking sheet you’ll see it come together. 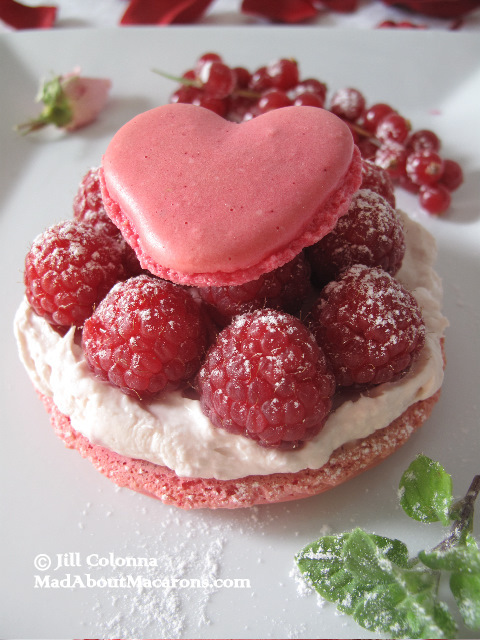 Instead of filling the macaron hearts, they’re also handy as a garnish for desserts. For a romantic dessert, try this Hermé-style simplistic version of rose mascarpone cream served on a giant rose macaron and topped with fragrant raspberries (recipe on p.109 in the book.) There’s only one problem: many of you are lucky enough to have red fruits in season just now but here there are no blooming raspberries around due to these Siberian winds – or at least worth buying them at an extraordinary cost and with no flavour. So I attempted something different. With the snow initially as inspiration, I remembered the Merveilleux pâtisserie from Un Dimanche à Paris with Mardi of EatLiveTravelWrite. It was basically a meringue coated with cream, infused with rose and orange flower water (although I didn’t really taste it enough), and rolled in white chocolate. Although I’m not the biggest fan of white chocolate, I chose it because it didn’t just look pretty but it was also deliciously light. Besides, I adore rose and orange blossom. 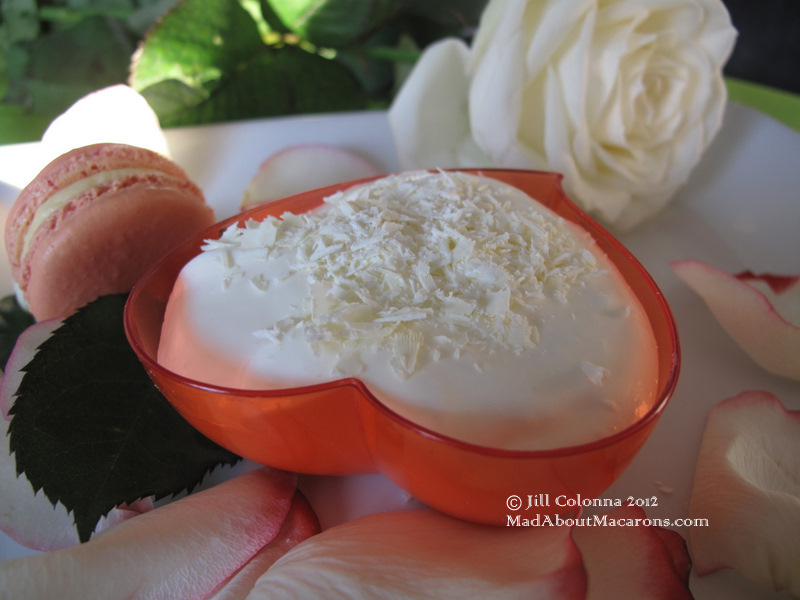 So with all this in mind, I’ve come up with a light, fragrant, snowy mousse for you that’s not too sweet: it’s a quick and easy gluten free dessert. What is it about rose that makes it so Valentine friendly? I adore this addition of the orange blossom. Heating the white chocolate in the pan with a little of the cream makes melting it so much easier – especially if you’re unsure of the quality of your chocolate. The meringue crunch comes from the macaron heart and the dosage of orange blossom and rose counteracts the sweetness of the chocolate and is just enough to send your Valentine into a billowy, romantic cloud. Accompany this with glass of chilled Muscat. 2. Meanwhile, break 120g of the white chocolate into a saucepan and heat very gently together with 50ml of the cream, rose and orange flower waters. As soon as it’s melted (after about 5 minutes), set aside to cool slightly. 2. Using an electric beater, whisk the rest of the cream with the egg white to medium-firm peaks. Gradually pour in the melted chocolate mixture and continue whisking until completely mixed together. 3. Pour into individual serving glasses and sprinkle on the grated white chocolate. Set aside in the fridge until needed. Halve the quantities if you’re serving just for a romantic couple but this does keep easily until the next day in the fridge. 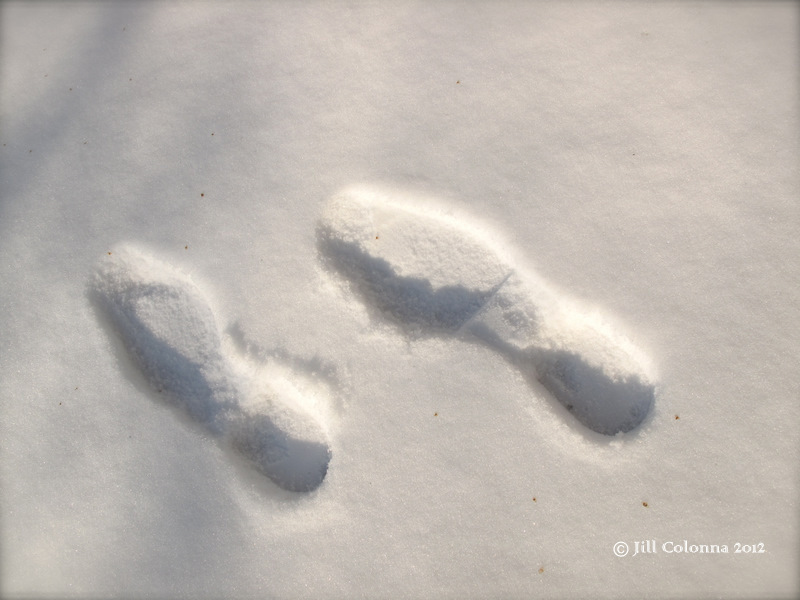 You could also serve this with macarons; if you don’t have cold feet! Well, I think anyone thinking this way should be sent a pot of this white chocolate treat by wonderful Jill Colonna, and I am most certain they will have an epiphany. 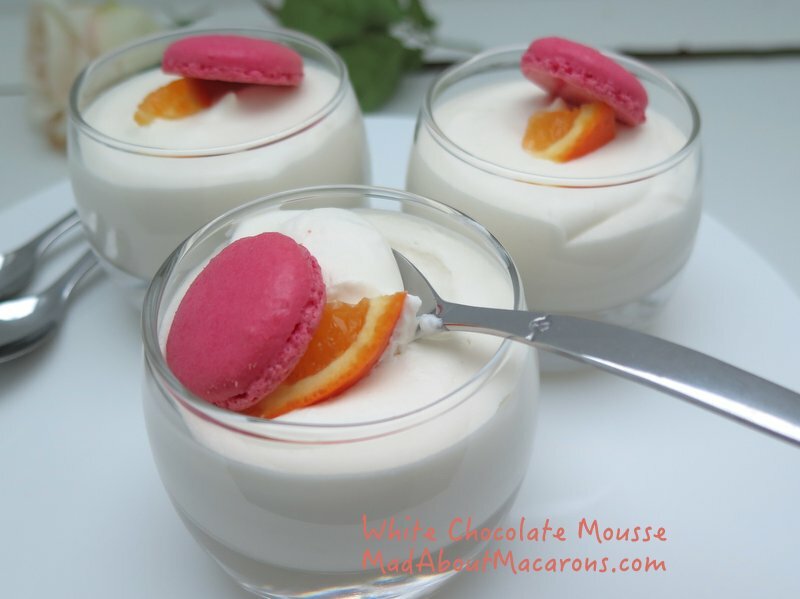 When I first saw this recipe posted on her fabulous blog “Mad about Macarons” (and I tell you, her macarons are truly to die for..), I couldn’t wait to make it, and chocolate mousse marathon seemed more than appropriate for it. 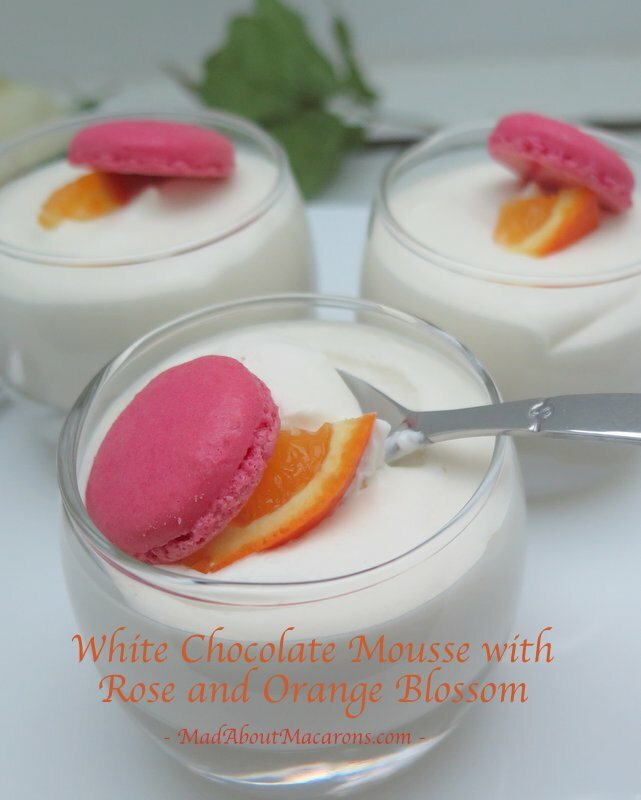 The lightest white chocolate mousse recipe with a touch of rose and orange blossom water to make even those who don't like white chocolate love this mousse! Meanwhile, break 120g of the white chocolate into a saucepan and heat very gently together with 50ml of the cream, rose and orange flower waters. As soon as it's melted (after about 5 minutes), set aside to cool slightly. Using an electric beater, whisk the rest of the cream with the egg white to medium-firm peaks. Gradually pour in the melted chocolate mixture and continue whisking until completely mixed together. Pour into individual serving glasses and sprinkle on the grated white chocolate. Set aside in the fridge until needed. Halve the quantities if you're serving just for a romantic couple but this does keep easily until the next day in the fridge.